August 17, 2012 - Campaigning Pilot Jeremy Rowsell is to set off on a record breaking flight from Sydney to London in a single engine aircraft powered 100 per cent by fuel made from plastic waste, an incredible journey that could change the face of the aviation industry. Jeremy will fly a Cessna 182 solo, cruising mainly at 5,000 feet, sometimes in 13 hour stretches, along the same route used by the barnstorming pilots of the 1920s and 1930s. He will attempt to better two records. First, a record flight time from Sydney to London for the aircraft type and second, to be the first pilot to fly an aircraft using a synthetic fuel derived from end of life plastic waste bio fuel as a single source of power. The revolutionary project called ‘On Wings of Waste’ came about after he witnessed first hand from the air, pollution on land and sea, and recognized the significant danger posed by ever increasing plastic waste. His concern about the environment and the consequences of an aviation industry reliant on toxic and damaging fuels gave him the drive and determination to test out a solution. “Flying is critical to the economy, vital for saving lives and is the best way to experience the planet we live on. We can’t stop flying, but how can we do that and do it sustainably?” said Jeremy, who was born in London but now lives in Sydney. “Our world is choking on human, plastic waste. In the middle of the Pacific Ocean is the Great Pacific Garbage Patch – a mire of plastic waste spanning millions of square kilometres. If it were a country, it would be one of the biggest on the planet.” he added. The discovery of an Irish company that takes end of life plastic waste, destined for landfill or possibly the ocean, and distils it into liquid fuel, was the catalyst for the project. Although recognized as a technical marvel, the fuel produced by a company called Cynar PLC, has never been tested in the air. “Aviation leads technology in many instances, why not do it once again with this fuel? If this plan works it would solve some major environmental problems all at once.” Jeremy (41) explained. Step two was to put together a team including international risk and survival specialist Tony Loughran and project manager Tarsha Burn, who is in charge of the strategic and tactical planning, sponsorship and production. The pilot has been put through rigorous tests. Tony, from Zerorisk International, has designed a series of mind and body bending survival courses from crash simulations to water survival, wilderness training and even a kidnapping, to prepare Jeremy for any eventuality. The flight will test his physical and mental endurance to the limit. Not that Jeremy is a novice. 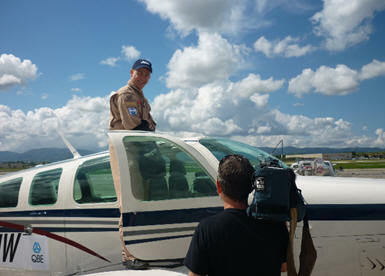 He has a passion for flying, with a piloting pedigree in his family that goes back to World War One. A pilot since he was 15, he has flown aerobatics, volunteered for the Royal Flying Doctors service and in a series of high-risk adventures in single engine airplanes he has logged 25,000 kilometers over the Pacific. In 2011 Jeremy flew the Pacific to re-trace the epic flight endeavor of Sir Charles Kingsford Smith in a tiny single engine aircraft, to raise money for the Royal Flying Doctor Service, so he is no stranger to perilous aerial adventure. The logistical challenges this time are massive. The plastic fuel has been tested in cars and is being rigorously tested to work in diesel powered airplanes. The airports where he stops will need to store this precious fuel to keep the integrity of the flight. He takes off on his exciting and potentially ground breaking mission, from Sydney later this year to fly more than 10,000 nautical miles and will chase a record time set by the pioneers. Stopping en route in Darwin, Christmas Island, Sri Lanka, Oman, Jordan and Malta, he is expected to arrive in London six days after departure. Jeremy will be able to keep the world updated on his progress through advanced satellite technology, including data communication tools from his aircraft and his exploits are expected to be made into a documentary film. Plastic takes 100 years to degrade, which means that every single piece we have not recycled still exists. Using a process called pyrolysis; plastics are heated in an oxygen-free environment to prevent them from burning, and then broken into their component hydrocarbons to create the equivalent of a petroleum distillate. This can then be separated into different fuels. As there is no burning of the plastics, but rather a melting process, there are NO toxic emissions released into the environment. The end product is cleaner, lower in sulfur, and in the case of a viable diesel used for transportation, it is a higher quality than regular diesel fuel. The pyrolysis process is able to recycle the carbon (that would otherwise reside in landfills or in the oceans), thus massive reduction in carbon dioxide emissions thus neatly fitting within the carbon footprint debate of aiming to be carbon neutral (Australia being the first to ratify the carbon tax). The end of life plastics can be recycled to 100%: 95% usable for diesel fuel, the remaining 5% is char (the solid material that remains) is given a second life and can be used in creating various floor coverings; the extrusion of the plastic fuel is required to go through a final refining process to bring it up to par for aviation diesel (this precious fuel can in effect run a GA fleet). This waste fuel can compete with the billions of barrels of fuel being produced every day around the globe. The world has stocks of landfills of plastic, industries and consumers dictate the need and use of a plethora of plastics, thus there will always be synthetic fuel reserves. The synthetic recyclable fuel, when used in vehicles, burns more effectively, which significantly indicates this is the fuel for the future, equaling a cleaner fuel for the planet. For the 4000L of plastic fuel that our world first ‘high wire’ flight will require to consume, approximately five tons of waste plastic will be required.